NASA is asking software coders on Earth to help a robotic astronaut helper on the International Space Station use its cold mechanical eyes to see better. Robonaut 2 — a humanoid robot being tested by astronauts on the space station — is designed to perform mundane and complex tasks to help make life on the orbiting lab easier for human crewmembers. So far, the robot (which NASA affectionately calls R2 for short) has carried out a series of routine tasks on the space station, performed sign language and learned how to shake hands with human crewmates. But NASA thinks the robot can do more and launched two new contests under the $10,000 Robonaut Challenge on Monday (April 1) to make it happen. 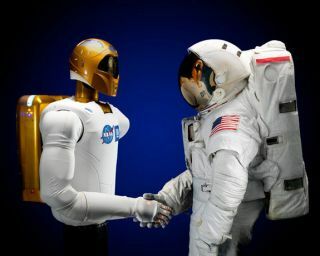 The new competitions, managed for NASA by the group TopCoder under the agency's NASA Tournament Lab, will give 470,000 software developers, digital creators and algorithmists the chance to help the robot butler "see" and interact with the station in a new way. In the International Space Station's Destiny laboratory, Robonaut 2 is pictured on Jan. 2, 2013, during a round of testing for the first humanoid robot in space. Ground teams put Robonaut through its paces as they remotely commanded it to operate valves on a task board. "Do you think your code and your solutions can help advance humankind by advancing a humanoid kind?" a promotional video for the competition exclaims. Contest participants in the two Robonaut competitions may eventually enable Robonaut 2 to better perform "repetitive, monotonous tasks" so that astronauts won't have to, according to a statement issued by TopCoder. The first contest involves writing an algorithm that will make Robonaut 2 locate and understand whether buttons and switches on a dashboard are turned off or on. NASA has provided images of the boards on the station, in a laboratory and in a simulator. Every setting has a different set of circumstances that the robot would need to work within. "The successful algorithm application must work with each of several different camera systems and varying lighting conditions within each environment," TopCoder officials said. The second competition builds on the first. Using the algorithm created during the first contest, competitors need to write more code that actually controls the motions of Robonaut 2's hands. "The algorithm will need to 'see' an object, recognize it, and correctly operate and interact with it in the most efficient and safe manner possible," TopCoder officials wrote. The $2.5 million Robonaut 2 weighs about 330 pounds (149 kilograms) and consists of a torso, arms and heads. From head to base, the robot is about 3 feet, 4 inches (1 meter) tall. NASA launched Robonaut 2 to the International Space Station in 2011 during the final flight of the space shuttle Discovery. The Robonaut Challenge is the latest in a series of space station contests by NASA and TopCoder to foster innovation in space technology and spaceflight. Together, NASA and TopCoder have conducted a $30,000 Longeron contest for software designed to help the space station maximize power from its solar arrays; a $24,000 Space Med Kit competition for a new algorithm for space medical monitoring; and the $13,000 Planetary Data System Idea Challenge (PDS) to a new way to search from NASA's more than 100 terabytes of space image and data from 30 years of planetary missions. TopCoder has also completed competitions for an International Space Station Food Intake Tracker (ISS-FIT) iPad App, which is aimed at tracking dietary needs of astronauts, and a Voice Command Idea Generation project. "We feel that our collective efforts on Robonaut 2, along with our successful Longeron, PDS and FIT programs have exposed the exciting prospect that game changing solutions can be created at reasonable cost by a new generation of engineers, programmers and technologists which is critical to innovation in the public sector and beyond," TopCoder President Rob Hughes said. For more information on NASA and TopCoder's Robonaut Challenge visit the competition page on TopCoder.com.